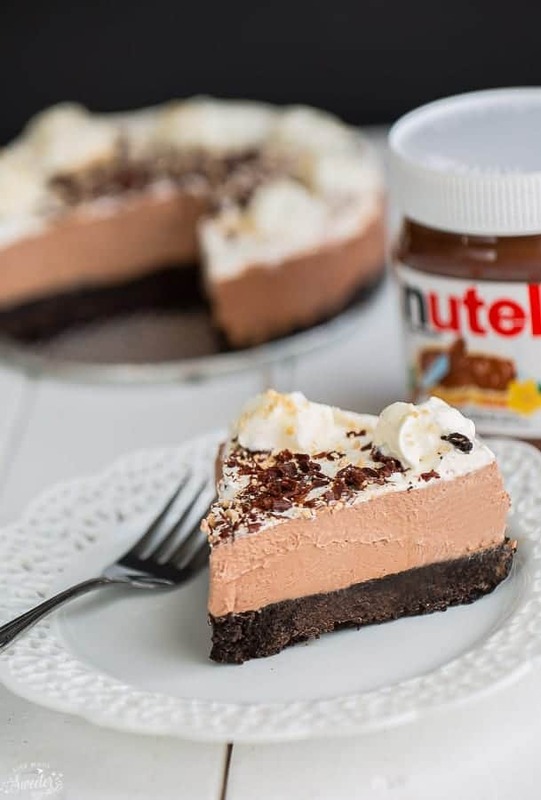 No-Bake Nutella Cheesecake Pie is so easy to make without having to turn on your oven. It makes the ultimate decadent treat. No-bake desserts are one of my favorite things to make whenever I’m in charge of bringing dessert. They’re perfect all year long but especially once the weather starts to get warmer. 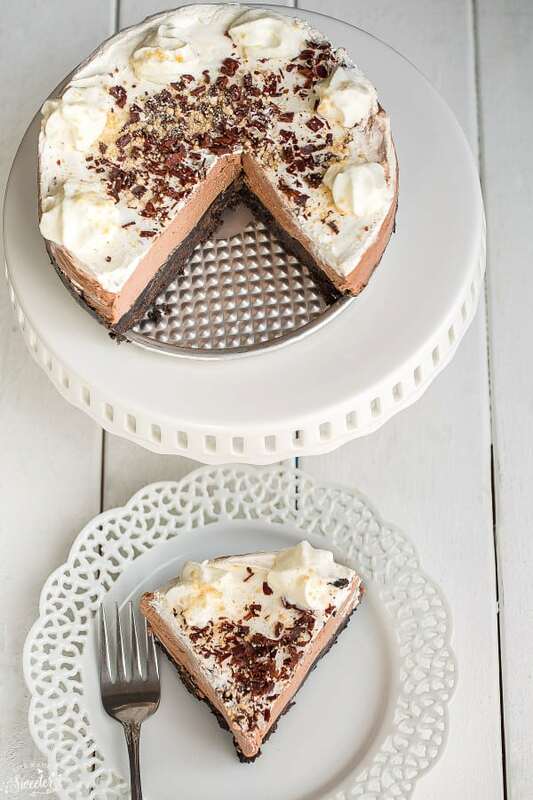 This No-Bake Nutella Cheesecake Pie is creamy, rich and is always a hit with guests. It’s so easy to whip up and only takes about 20 minutes of prep time. 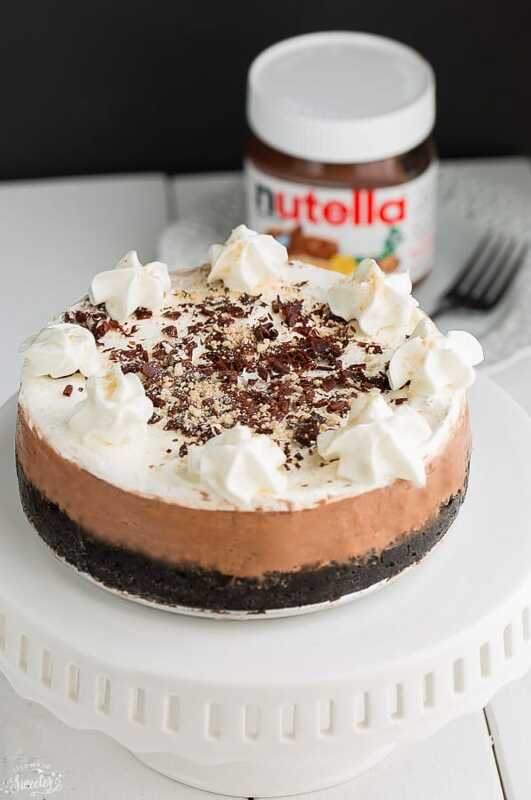 It starts off with an no bake Oreo cookie crust followed by a creamy Nutella cheesecake mousse layer that will knock your socks off! The layer of whipped cream with a sprinkle of shaved chocolate and more cookie crumbs makes takes this cake to the next level of amazingness. The hardest part is just waiting for this cake to chill up in the fridge. It’s a rich and decadent dessert and a must for any Nutella fan! 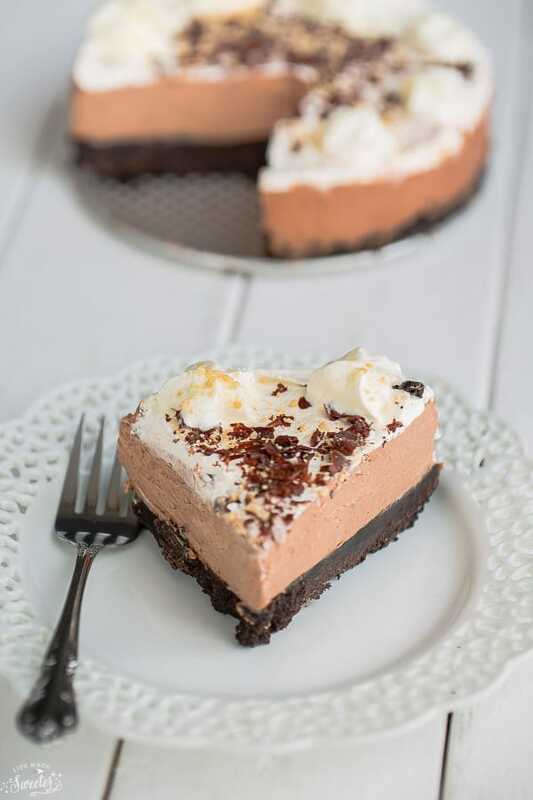 No-Bake Nutella Cheesecake Pie is creamy, rich and so easy to make without having to turn on your oven. It makes the ultimate decadent treat. In a medium bowl, use a fork to combine the Oreo crumbs and melted butter until moistened. Press into the bottom and about 1-inch up the sides of a 6-inch springform pan. Place in the freezer while making the filling. Using an electric mixer with a whisk attachment, whip all the heavy cream for both the Nutella and Whipped cream filling on medium-high speed until stiff peaks form. Refrigerate until ready to use. Using a hand mixer or stand mixer with the paddle attachment, cream together the Nutella, cream cheese and vanilla extract on medium speed until light and fluffy. Reduce the speed to low and gradually add the powdered sugar. Fold in half of the whipped cream with a rubber spatula until incorporated with the cream cheese mixture. Put remaining half in the refrigerator for the next layer. Add the batter to the chilled Oreo crust smoothing out top with a spatula. Refrigerate for about 20 minutes for Nutella filling to firm up a little bit. Spoon with the other half of the whipped cream or whipped topping smoothing with a spatula. Refrigerate until firm or at least 2-3 hours (or overnight) before serving. Sprinkle with shaved chocolate and more Oreo cookie crumbs if desired. Leftovers can be stored in the refrigerator stored in an airtight container for up to 3 days.